Fast, secure and reliable servers for your Open-Realty website. Hosting for your Open-Realty website that just works. Servers optimized to give you the best Open-Realty experience possible. We’ll even install Open-Realty for you! We’ll move the Open-Realty site for you! Softaculous auto-installer – Install Open-Realty in just a few clicks. GD support – Needed for many Open-Realty plugins. Zend and Ioncube support – Needed for some Open-Realty plugins. Open-Realty is the world’s leading FREE (and most copied ) real estate listing marketing and management CMS application, and has enjoyed being the real estate web site software of choice for professional web site developers since 2002. 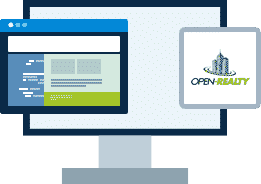 Open-Realty provides for easy installation, integrated blogging, lead capture, search engine optimization, highly customizable templates, virtual tour support, advanced configurable search capabilities, and many other highly-desirable site management features. Combine our proven, and industry leading listing management software with available commercial add-ons such as our IDX FTP MLS data import tool, RETS MLS data import tool, and our advanced Google maps integration, and you have all the tools needed to create a top real estate website in any market.